Since it opened in 1913, the BAM has seen a number of architectural and technical changes. The purpose of the different stages of the renovation work, and in particular the last phase, which was completed in 2013, was to make sure the museum could host exhibitions on an international scale. The Musée des Beaux-Arts now stands out thanks to the quality of the warm welcome it offers and the environment it inhabits. The BAM has been designed to offer a unique experience, a space where visitors can discover artistic creativity in all its forms, a living environment where events are held throughout the year. Particular attention has been paid to making the public areas welcoming, practical spaces, including the ticket office, the shop, the garden and the cloakrooms. 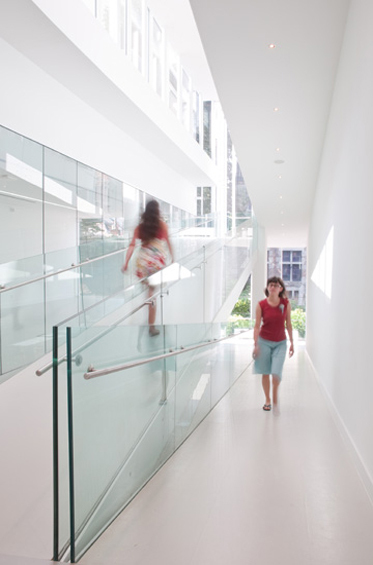 This unashamedly contemporary architectural project therefore now combines the practical demands and rigour of a museum with aesthetics, as the museum’s architecture has been preserved, showcasing the light and airy passageways and embracing transparency. The recent renovation work has transformed the BAM into a major cultural tool, boasting 3 floors and 2.000m² of exhibition space, as well as the Reine Astrid garden, which is also available for exhibitions. Not forgetting the educational department, “Dynamusée”, with three activity areas and an auditorium that can seat 80 people.